I received this in my email this morning and just got permission to post it. GRAVE WITCH is my upcoming October release from Roc. This is not the final version of the cover as quotes still need to be added to it, but the art is final. Isn't it breathtaking? Personally, I'm in awe! What do you think? (If you repost, please note that this is not the final version of the cover.) I will be posting a blurb and excerpt soon, so stay tuned. Also, have you joined the mailing list yet? Once I have permission to release an excerpt, I intend to make it available on my newsletter first. If you are looking for where to sign-up, you can do so in the box below. I'm confused. 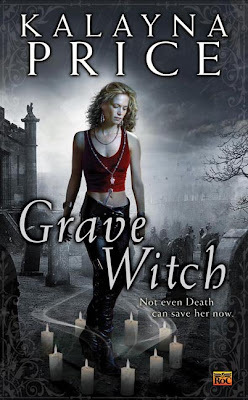 I found your blog while looking up Twice Dead, then saw the cover for Grave Witch. Do you have two series out? I read the excerpts for the Kita books, but can't find anything but the cover for Grave Witch novel. BTW I enjoyed the the excerpts for Once Bitten and Twice Dead. Thanks Lori, Scape-graces, Tyhitia, and Debra! 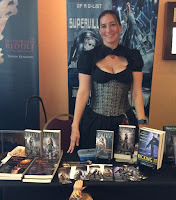 Mardel, Once Bitten and Twice Dead are the first two books (out of six) in my Haven series being released by Bell Bridge Books. 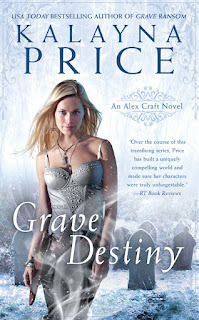 Grave Witch is the first book in my upcoming Alex Craft series which will be released by Roc starting in October. I don't have a lot of information up on the site about Grave Witch yet, but that will be rectified in the next few weeks. Thanks for stopping by! Great cover! Should definitely pull readers to grab off shelf and investigate further. The cover is awesome, did you have a model? I am wondering who she is because she looks just like me! My co-worker bought this book and just had to show me. Now all of my co-workers think I'm doing this on the side! Where am I web crawling today?